Unlike dishwashers that are more energy efficient than hand washing when used full, until recently there is no such thing as an EnergyStar clothes dryer and the ratings agency is not really enthusiastic about them. Electric clothes dryers account for 10-15% of our home energy usage. If you have sunny weather, outdoors is the place; in dry climates dry time can be as short as 1/2 hour. In less dry and warm places, be creative around your house, the drying clothes can actually put some moisture back into a home being heated with forced air heating. Americans seem much more enamored of the electric dryers than Europeans who often don’t use them due to space constraints. Those that do use them do so sparingly because of higher energy costs. While you can find many fine clothes drying rack choices at Ikea, Target, Lowes’s, Ace Hardware you’ll have many more uniques choices if you go online. Do a search on “clothes drying rack” (aka clothes horse) and click on the images for an amazing array of choices, especially those space efficient models that those around the globe have developed over the years. Here are some that I found intriguing at Bright Green Ideas. While I won’t be giving up my dryer, there certain categories of laundry that I air dry regularly with a combination of hangers (shirts) and racks. Since time is a constraint I am blessed that I usually don’t need to bother with pins (pegs) and that my drying areas (racks on upper balcony, hangers in nearby bathroom, wire shelving near washer/dryer for lingerie). Like all parts of our homes, I am constantly tweaking for a more efficient combination of lines, racks and spaces for our home. The cold, deep, fast running water is the healthiest as it harbors the fewest bad bugs and bacteria. Please explain to me why leaving water running is bad! 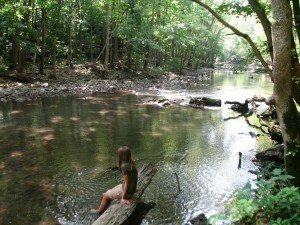 Fresh water is a limited resource; how does running it and using it end up ruining the fresh water?! 20% of energy in the US is used just to pump, clean and filter water. Even if you pour clean water back into the drain it gets mixed up with the dirty stuff and has to be re-pumped and re-cleaned endlessly. PS. Here’s a wonderful design concept to clean your water at home. We installed solar electric in July 2007 in Northern California. When you install solar in PG&E territory you change from a residential customer to a commercial producer and receive a monthly accounting. As days become shorter and colder we use more electricity and we’re starting to eat into our summer surplus. Next July will tell if we properly projected our usage and size of our system. Real Goods Solar (then operating as Marin Solar) did our installation and we are extraordinarily pleased with their service and work. We used Sunpower panels which, at the time, were the most efficient panels available. Being an accountant, a cost-benefit analysis was a must. Being house rich and cash poor we took out a HELOC loan to pay for the system but our monthly payments are equal to our previous average electric bill. The previous 3 years electric bills increased annually an average of 12% so, just keeping the monthly payment the same for the next 20 years will protect us from energy inflation. I’ve been considering a solar battery charger to keep those pesky batteries on cell phones, iPods & cameras on ready call. Some research though is making me reconsider. The jury is still out on this decision. Update, July 2011: PG&E, calculated our year-end discrepancy and we owed the equivalent of one to 1-1/2 month’s bill to them at year-end. This is mainly because much of the family decided that “since we have solar, it doesn’t matter how much electricity we use” – NOT! All being said, I think we calculated our optimal usage and number of panels appropriately. As the children move out of the house we should be able to run a surplus and sell back to PG&E under California Public Utilities Commission ruling on Net Energy Metering (NEM) . We’re looking into solar thermal (hot water). I understand it, there is great variation on recommended systems depending on what part of the country that you live in so read this \”Homeowners Perspective\”, based in the San Francisco Bay area, with that in mind. Search out solar hot water information based in your local area for the best info for you. Have you scrubbed a pot using one of those green scratch pads lately? Most of us have. Did you know that they are made of oil-based plastic that breaks down as you scrub and those small pieces go down your drain, into the municipal water treatment, are filtered out and end up eventually in the Bay and ociean? Along with microscopic broken bits of plastic bags and bottlecaps they become part of fish and crustacean diets. Plastic has now become a defacto part of seafood flesh – yum, yum. Solution? Loofah & agave scrubbers. Loofah (my sister grew some in LA one year) & agave are plants. Loofah can be purchased as a yarn if you have time to knit or crochet your own scrubber. As for me, 3M recently introduced scrubbers from agave (found some at Target) but there are probably others (let me know in comments).The sponge part of the old double-sided scrubbers has been natural sponge but with chemical dyes (bye-bye purple, orange, blue). 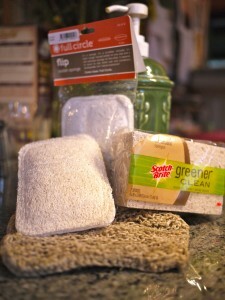 The new sponges are made of recycled paper and natural fibers and have no chemical dyes. Loofah, natural sponge, paper, yarn are components of these manufactured and handmade scrubbers. I’m less enthusiast about the 3M soap loaded scrubbers. Soap is phosphorus free and scrubbers are from recycled plastic, but, again, plastic bits into the water stream. Their wipes are from bamboo, rayon (pulpy part of cotton plant), cotton & corn, presumably new material since recycled isn’t mentioned but all are compostable. Read labels & go online for details. Remember, you don’t need to see scads of bubbles for a dish detergent to do its job. Though it seems counterintuitive, rinsing with cold water is best because bacteria thrive in warm (i.e. temperatures that our hands can handle) water but not cold. Absorb grease and other food stuck to plate with old napkins, paper towels and put in garbage. Keep a strainer in the sinkhole. The more grease and food particles that go through your municipal water plant, the more energy they must use to clean your water. Amory Lovins in the 8/26/2007 issue of Newsweek spoke about steps the government can take to slow oil addiction. 1) Get the most energy efficient vehicle (both in terms of energy used to manufacture the car and energy it uses). Drive the vehicle properly to maximize efficiency. 3) Try to live nearer to where you work, shop, attend school and recreate. 4) Push for fairer competition between all ways to get around. Write or call your legislators at all levels, attend local meetings.